Our latest featured build video is based on our "Enthusiast Gaming" build guide. Check below for the complete part list and a special Newegg combo based on the components recommended in the guide and video! A special thanks to our friends at MSI for providing the Z170A Tomahawk AC Motherboard for us to use in this video. Be sure to also check out the Completed Build, which includes more pictures and some benchmarks. Newegg has put together a SuperCombo based on our "Enthusiast Gaming" build guide and this video. If you're considering building a system based around this guide, make sure to check it out! Update: The original SuperCombo above is no longer available, but Newegg has kindly made an alternate SuperCombo that is even closer to our build video components. A big thanks to them for making this offer available! This is just my opinion based on hours and hours of reviews and benchmarks done across multiple sites. Grab an air cooled i7 6700k instead of a water cooled 6600k. Reason: The base clock of the i7 allows slightly weaker motherboards to be able to get to the 4.4 ghz pretty darn easily. Also if you plan on ever doing any sort of content creation such as streaming or editing youtube videos it will come in handy if you ever want to dip into that sort of thing. There are pros and cons of going with air over water but the main reason is price to performance. The cryorg H7 is an amazing cooler that will keep the i7 6700k well below 80 C Whilst overclocked and costs half as much as the 240mm rad. I do recommend that if you're trying to do a much higher OC say 4.6 4.7 you would do better with a water cooling solution but at that point you would have to upgrade your motherboard as well to handle the overclock. Cut down on the storage. I really cant see a reason for such an insane amount of storage and it is severly eating into the overall budget of this build. If you are a gamer and you are using over 1 TB of storage then I think you need to drastically cut down on your high definition video downloads. In addition the brands of storage do not fill me with confidence. Pretty much just common sense here. Increase the power supply. For the gtx 1080 and being able to make the most out of the turbo boost 3.0 I would go for the minimum of the EVGA G2 650W, getting the 750 watt version if I would like headroom for adding SLI later. For the savings on the storage you can get a significantly better model of 1080 going with the Asus ROG Strix Look up some benchmarks. That card is amazing. Here is the link for my 1500 dollar build. One of the other nice things about this selection of parts is the fact that all of the lighting in this build comes with it. The mobo gpu and case all work in unison with Asus' Aura software. Grab an air cooled i7 6700k instead of a water cooled 6600k. Reason: The base clock of the i7 allows slightly weaker motherboards to be able to get to the 4.4 ghz pretty darn easily. What do you mean by 'weaker'? Most motherboards overclock pretty similarly. I really cant see a reason for such an insane amount of storage and it is severly eating into the overall budget of this build. If you are a gamer and you are using over 1 TB of storage then I think you need to drastically cut down on your high definition video downloads. By weaker I mean worse power distribution. You can increase the motherboard budget by the savings you get from going from 67k to 66k and get similar performance. It would just be easier to push the cpu to 4.6 7 8 with a better mobo. That is still 15-20 AAA games on one terabyte. I dont think anyone regularly plays that many games. I would remove some! I have used a 320 GB hard drive for the past 3 years with no issues gaming. I'm in the same place you are. I have a 256GB SSD as my only storage (Here come the comments. =) drive, and have not filled it up yet. However, some have 20 or more games - maybe not played every day, but a few times a month. Maybe they don't want to lose all of their progress in a game. What about my dvd backups? (8gb each) (blu rays can be 25-50gb each) and anything that has to do with content creation? You can eat 1tb without too much trouble, it just depends on what you are doing. Then in that case you would need to get a different case and use the dvd blu ray read/writer you obviously already have for your content creation storage. The only reason you'd need a blu ray drive for content creation is if you wanted to store old projects on disks, even then you can just use a usb disk drive for that. This build has a 550 Watt PSU for a ~400 Watt system. That's more than enough headroom for overclocking both CPU and GPU, although the difference in price here isn't enough to justify skimping. If you want to spend another 20 bucks for a bit more headroom, that's fine, but it's really not necessary. I wouldn't recommend SLI to anyone at this point, but if you really feel the need for that kind of expansion, 750 Watts is probably best (that puts our system TDP at around 580 Watts, so 750 still gives enough headroom for overclocking, while 650 might be cutting it close). Question about your build. It says some drive bays aren't usable is that okay? Also can I add a DVD drive to this build or no? Its talking about those optional SSD mounts you can see in the case picture with the side view window. There are mounts in the cable management space in the back window and underneath in the PSU shroud so you're fine. Also no, you'll have to use an external drive. I personally think Optical drives are really outdated, and I haven't really found a case with optical drive slots that I like. Ask around, I'm sure someone will give you a good recommendation..the Corsair 100R is alright I guess. MSI Pick Your Holiday Dream PC Giveaway coming soon. Hi, First of all let me say "Very Nice Build" i love it. I have a Question about the Video Card, i love the fact that it can be attached that way so you can see it very nicely, but, isn't it in that position having any issue cooling it's self with the fan facing the glass? it looks like there is a very small room for air to go directly to the Video Card, have you noticed heating increase compared if it was regularly attached directly to the MB? Are u guys ever gonna make a build with hybrid graphics ? I'm using this build as a base for my own. 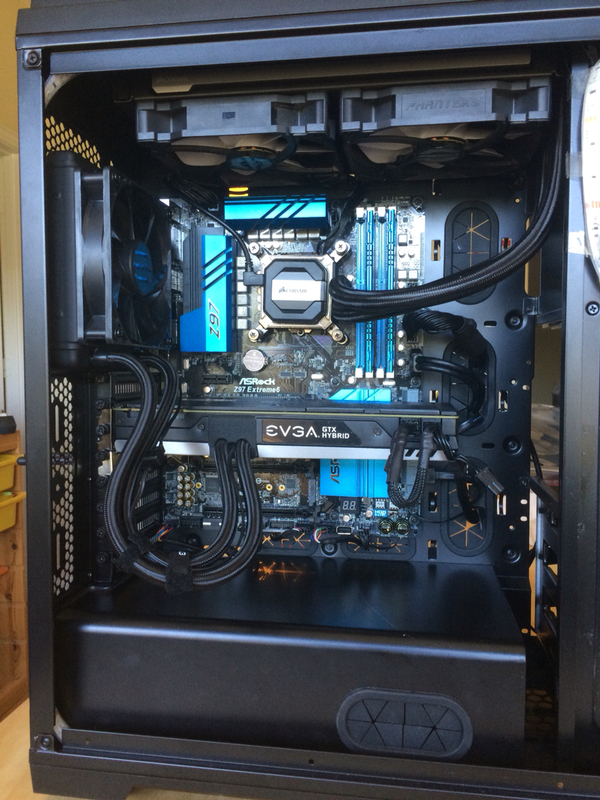 Can someone tell me what that black riser flexible cable is for? It's used to mount the GPU vertically, allowing the front of the card to be viewed in the window. The case has mounting options for both vertical installation (as we did in the video) and the more traditional horizontal location (directly on the motherboard). I'm concerned about power consumption in any computer I build. For a PC in "light-use" mode (just doing normal web surfing, spreadsheet and non-gaming stuff, etc) can anyone tell me how much difference in power draw there would be between a Gold-certified 550W power supply and a Gold-certified 750W power supply? Is it actually 200W, or is the "idle state" power draw of the two PSUs about the same? Stop with these red and black (or randomly coloured) builds! Atleast it was red and black with white accents. I do agree that black and red is a very common theme but adding in the white accents makes it stand out a bit from the rest. Most parts come in Red and Black. Try building a blue and black with stock parts. I mean this is my partlist here and a picture with the system off. It does have blue LEDs that surround the windows of the case also. Planning on getting some either black and blue or white and blue cable kit at some point also. Yep it would. But Boreas is AMD ..... hahaha! AMD Representative : [To engineering team] SEE? THIS IS WHAT HAPPENS WHEN YOU IDIOTS DON'T RELEASE ZEN ON TIME! YOU'RE FIRED!!! Uhh... I don't think AMD would fire it's most talented engineers. Also, Zen is ready, AMD's top brass isn't releasing it now for some reason. Uhh... I don't think AMD would fire it's most talented engineers. I know. =D Just a joke. Also, Zen is ready, AMD's top brass isn't releasing it now for some reason. most likely trying to raise the stock production clock.... 3.4 simply wont cut it(at least for gamers) unless its priced even lower than the optimisticly low guesses we have seen. an 8 core 16 thread barely beating the 4 core 8 thread intel chip in highly multi thread based tasks means its likely to lose heavily in applications that dont make good use of multi threading. Strikethroughs do nothing to hide your shame.